John Crossman Speaking at the 44th Annual Legislative Conference in Washington, D.C.
John Crossman will be discussing how there is a current lack of ownership of homes and commercial real estate in the African American community, which relates back to Jim Crow’s law and is a direct link to slavery. Crossman says, “Slavery is bigger now than it has ever been because of human trafficking, which affects everyone around the world.” John is working to put real estate education in historically black colleges and universities across the country and supports the efforts to end human trafficking. DAYTONA BEACH, FL –The family of the late Rev. 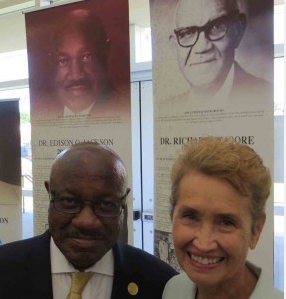 Kenneth C. Crossman has been named 2014 Philanthropists of the Year by Bethune-Cookman University in Daytona Beach. Rev. Crossman was a pastor and a civil rights pioneer throughout the south prior to his death in 2004. From inviting black leaders to preach at his church to organizing a sanitation workers’ strike in South Florida, he remained committed to building unity and promoting equality and fairness. To honor his last wish, his family endowed the Rev. Kenneth C. Crossman scholarship at B-CU in his memory. The family also established the Rev. Kenneth Crossman Endowed Chair at the university. Carrying on the family tradition of service, son John is currently helping B-CU establish a real estate program for its business school. “A career in real estate, particularly commercial real estate, can be a pathway to wealth, but many historically black colleges and universities don’t yet offer programs in real estate. These students deserve the opportunity to succeed in and become leaders in a field that can reward them while the industry benefits from diversity that is much-needed and much-desired,” he said. TALLAHASSEE, FL – John Crossman, President of Crossman & Company, is a lifelong member of the Florida State University Alumni Association. This year, Crossman raised $55,000 for the ICSC Foundation to benefit Florida State students majoring in real estate. At the request of Florida State University, about 15 years ago, John Crossman created a program called “If I Were 21” to help train students in developing a career in real estate. Training includes conference preparation, networking tips, resume building, choosing a specialty and career building among others. This presentation is part of the FSU Trends Conference in November where over 120 students and 30 real estate executives are involved in the presentation. Today, John Crossman will be speaking at two classes, Real Estate Principles and Real Estate Investments at Florida State University. Crossman’s goal for the classes is twofold and directed at students who are unsure of what area of real estate they want to study and those students who are preparing for graduation. For students interested in real estate but are not sure of which area of real estate to focus on, Crossman will walk them through the basic process on how to pick an area of real estate. For students nearing graduation, Crossman will help them focus on developing a plan to find a job and build a career. “I tell students to see me as there big brother. I welcome them to ask me any question and encourage them to connect to me through social media. I hope to help them to take their careers to the next level,” said John Crossman. “These two presentations help to prepare the students to maximize the FSU Trends Conference in November,” Crossman notes. TEMPLE TERRACE, FL – Terrace Ridge Plaza, a 66,527 square-foot Publix-anchored Shopping Center, was built in 1987 and is currently in the renewal periods of the initial anchor lease. Terrace Ridge was a highly desired asset due to its anchor sales volume, proximity to the University of South Florida and its limited exposure to shop space; having less than twelve-thousand total square-feet to lease. Crossman & Company’s Investment Sales Department recently worked alongside the Seller, Centurion Realty of New York, NY to close the deal. The property is 12 miles North of Downton Tampa and held an occupancy percentage at 97.5%.